When all is said and done, the most honored and influential person to emerge from my hometown will likely be James Brown. But, in all fairness -- not too many years ago -- there were some folks there in Augusta who were reluctant to embrace James as a native son. It's true that JB had more than his fair share of unsavory situations that were -- no doubt -- a nightmare for whoever handled his PR.... if, in fact, anybody handled PR for him. And, years ago, when he burst onto the national stage, much of the country -- including Augusta -- was still struggling with an evolving mindset about race and equality. I recall the dismay expressed by some Augustans when -- 25 or 30 years ago -- JB bought a nice home in an upscale, established Augusta neighborhood. But times have changed..... and, over the last 30 years or so, JB became lovingly embraced by the home folks. And, in 2005, a 7-foot tall statue of JB was unveiled right in the heart of downtown. Through all the good times, and his personal rough times, James never wavered in his love and support of Augusta and its people. Only three days before his death, James was holding his annual toy giveaway for underprivileged kids in Augusta at a downtown theatre. It was the 15th year in a row that he had sponsored -- and been there for -- the charitable event. James especially loved downtown Augusta. It was on those very streets that -- in the 1940s -- he earned pennies by dancing for folks passing by, and by shining shoes. In the late 1960s, he bought Augusta's oldest radio station, WRDW. Then, he would pause.... and add.... "Now I own that station." It was his way of encouraging struggling youngsters to stick to their dreams and ambitions. All of us around Augusta in the 1950s were familiar with this local band called "James Brown and the Famous Flames" long before the rest of the world discovered him. I saw JB perform in person only once, at the old minor league ball park in Augusta. Much later, on another occasion, I did have a brief phone conversation with him. It was around 1982 or 83 when I heard James was planning to be in Nashville for some event, and I desperately wanted to interview him on my local talk show Miller & Co. I got the phone number for James Brown Enterprises, headquartered in Augusta. I called the number, and a man answered, saying simply, "Hello." "Is this the headquarters of James Brown Enterprises? ", I asked. A raspy voice answered, "Yeah, this is James Brown." My goodness, the Godfather of Soul answered his own phone! The interview never happened, but the phone call alone provided me with fodder for conversation for years. I shouldn't have been surprised that James Brown answered his own phone. My pal Don Rhodes, a columnist with the Augusta Chronicle, writes; "to local residents, he was the guy you would see in local theaters watching afternoon movies, pumping his own gas at a station near his home in Beech Island, S.C., supporting local musicians at area nightspots, eating in local restaurants and just being human instead of being the superstar." I enjoyed James Brown's music.... and his early 1960s version of "Prisoner Of Love" ranks alongside Etta James' recording of "At Last" and Ray Charles' version of "Georgia On My Mind" as the finest interpretations of "pop standards" ever performed by rhythm and blues artists. 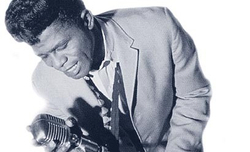 James Brown forever changed music. He helped change my home town. He was an imperfect, immensely talented man who did a lot of good things. As a former Augustan, I'm happy that James was so appreciated there at home. And, that he knew it. Just four months before his death, Augusta proudly honored its own son by renaming their 8,500 seat arena, the James Brown Civic Center. And that civic center is the place where James Brown's body was brought to, again, be honored by his home town.